The federal transportation act, MAP-21 (2012), set in motion the requirement to have a performance-driven, outcomes-based, transportation planning and decision making process. 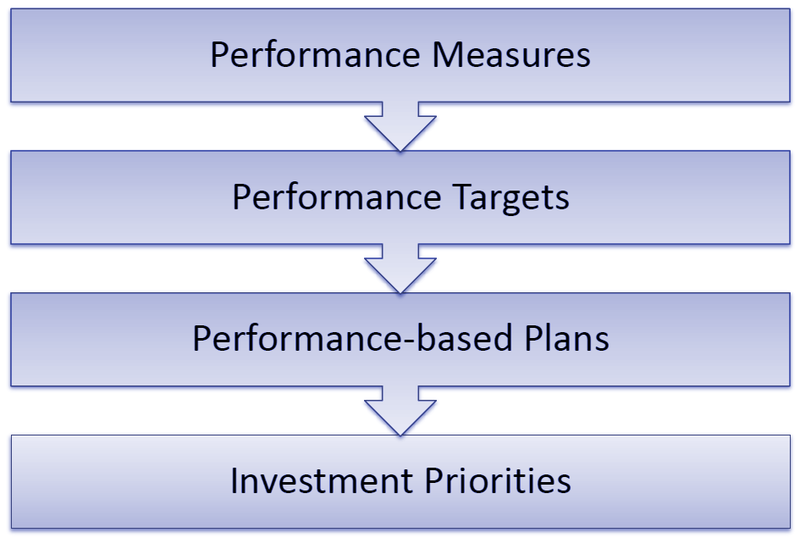 Transportation Performance Management is a strategic approach that uses data and system information in order to help make transportation investment and policy decisions (see Figure). It is systematically applied as part of an ongoing process. It is hoped that the approach will help improve communications between decision makers, stakeholders and the traveling public on transportation investment decision making. National performance goals established in MAP-21 and carried into the FAST Act include: safety; infrastructure condition; congestion reduction; system reliability; freight movement; economic vitality; environmental sustainability; and a reduction in project delivery delays. The performance-based transportation planning process is designed to work toward achieving these national goals. The goals look to achieve a reduction in traffic fatalities and serious injuries on all public roads, maintain transportation infrastructure in a state of good repair, achieve a significant reduction in congestion on the National Highway System, and improve the national freight network to provide access to national and international trade markets and support regional economic development. Progress toward these national goals is measured through use of performance measures and targets, integrated into performance-based plans by RTC, WSDOT and C-TRAN with TIPs programming investments into transportation projects and programs that can help meet the national goals. RTC will coordinate with Washington State Department of Transportation and C-TRAN to decide on performance targets and from October 1, 2018, Performance Based Planning and Programming will be integrated into RTC’s Regional Transportation Plan and Transportation Improvement Program.